None of us really have any idea what to expect from Timmy, Tony and Manu. We pretended we knew better. We surmised. We guesstimated. We listened to the earnest clips from Gregg Popovich, telling us all that the Spurs would never get over what happened in Miami after those ropes started ringing the floor late in Game 6 last June, and we co-signed instantaneously. Because it was all coming from Gregg Popovich. AP Photo/Sue Ogrocki Kevin Durant's streak is safe. The Spurs? They'll have to start a new one Sunday against the Griz. This might have been the one time that the peerless Pop didn't know what to expect, either. The Spurs, remember, had never lost an NBA Finals before the 2013 edition. They were 4-for-4 on the big stage until suffering the most painful of Finals endings. No one, not even Pop, could forecast with any certainty how Tim Duncan and Tony Parker and Manu Ginobili would respond to the agony of letting last spring's championship slip away. Or how they would cope with the miserable 82-game grind in their path just to get back to the playoffs to try again. I'd say we have our answer now. Those same Spurs who trail only the rag-tag Los Angeles Lakers and Milwaukee Bucks in terms of starting lineups trotted out this season -- thanks to all those early injuries -- just lugged a string of 19 consecutive victories into Oklahoma City. The fifth-longest winning streak, to be precise, in regular-season history. Which would suggest that the purportedly inconsolable Spurs are coping with the grind better than, say, this league's reigning two-time champs, given how often we've heard LeBron James openly advertise his frustration with how the Miami Heat have been handling those 82 games ... complaining that only stopped because the Indiana Pacers were kind enough to start unraveling in March. The Spurs? They just march on. The winning streak finally ended Thursday night with a rather predictable 106-94 defeat to their uberathletic Lex Luthors from Oklahoma City, on the second night of a back-to-back, with Duncan and Parker recalled to the bench to watch the entire fourth quarter and Ginobili not even in uniform. Yet it seems safe to suggest, using the 76 games of evidence in our possession, that San Antonio's first loss since a Feb. 21 setback in Phoenix shouldn't leave much of a mark. If you want a glimpse of how spry and feisty the Spurs feel, with the playoffs slightly more than two weeks away now, consider that the aforementioned Parker and Duncan successfully lobbied Popovich to let them play against the Thunder, when the circumstances had numerous Pop-watchers convinced that each of his three seen-it-all sages would be in street clothes for San Antonio's fifth game in eight days. Just like they've been doing all season. Of the 18 teams in league history to lose Game 7 in the Finals, San Antonio is threatening to register the best winning percentage of them all. The 2005-06 Detroit Pistons posted a .780 regular-season success rate after losing Game 7 in 2005 to the Spurs; Pop and Co. slipped to. 776 with this loss to the Thunder but will surprise no one if they manufacture the 5-1 finish needed to trump those Pistons. At worst, San Antonio will almost certainly become just the third of those 18 teams to post the league's best record in the following season, joining two different Detroit teams (1987-88 and 2005-06) and, more importantly, securing homecourt advantage throughout the playoffs. Oklahoma City's second-half dominance in this latest showdown, securing a tidy 4-0 season sweep for the Thunder, only served to reinforce how problematic MVP favorite Kevin Durant and his crew have gotten for the Spurs. The youth and athleticism and two-man devastation Durant and Russell Westbrook can inflict continue to be the biggest problems Pop has to contend with in what looks like yet another Coach of the Year-worthy season for him. What else besides the Thunder is causing any lasting angst in the Alamo City? Once you scrape off the standard layer of Spurs pessimism -- which they glaze on thick even in the best of times -- that would be nada. Nothing beyond the usual nightly prayers for continued good health. It's true that the Thunder cruised, in the end, even without Thabo Sefolosha on the floor to harass Parker as he expertly can. But don't lose sight of how valuable that No. 1 seed is bound to be in this maniacally crazy West that forces teams to win 50 games if they want to be sure of a playoff spot. The Spurs were going to be fretting about how they match up with OKC in a seven-game series even had they won this TNT showcase in a rout. Yet you can rest assured they'll be favored against anyone else they draw in their conference. They're undeniably deeper than they were last season with the likes of Marco Belinelli, Patty Mills and Jeff Ayres all making more of an impact off the bench than anticipated. And Pop has kept everyone fresh, like he does better than anyone, by playing no one more than 30 minutes per game during the streak apart from 22-year-old Kawhi Leonard. For the record: Leonard averaged a mere 30 minutes per game, on the nose, during the 19 consecutive W's, all part of a resume that has the Spurs at 51-10 in the 61 games Kawhi has dressed for. The Thunder, furthermore, might well have to see off the Memphis Grizzlies and the Los Angeles Clippers just to get the Spurs back on their floor before next season. The greybeards in silver and black will gladly live with that. They keep showing us, day after day after day, that they can handle more than we ever thought in the wake of the heartbreak that was supposed to bury them. MVP: Russell Westbrook. He had 27 points, six assists and four steals, sure, but it was his attacking mentality for the Thunder that really set the tone and bothered the Spurs defense, especially in the second half. X factor: Oklahoma City's length. It had been a while since the Spurs played against a long, athletic, top-notch defense. 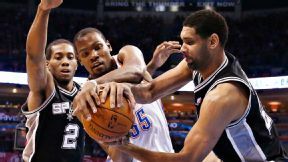 San Antonio couldn't cope with the Thunder's ability to help and recover quicker than the Spurs had seen in some time. Turning point: Kawhi Leonard didn't start the second half. Kevin Durant shot 4-of-13 in the first half, but drew three fouls on Leonard. Leonard sat to start the third quarter and Durant went for 12 points on 6-for-9 shooting in the period as the Thunder took control of the game. MVP: Dirk Nowitzki led Dallas to its first win over the Clippers this year, with 26 points on 10-of-18 shooting and 11 rebounds. He hit two big 3s and a pair of clutch free throws in the fourth quarter to give Dallas a much-needed victory. X factor: The hot outside shooting from Dallas was the defining factor in a close game. The Mavericks hit 14 of 29 shots from behind the arc compared to the Clippers' cold 6-of-27 performance. That was ... tense. With a 109-97 lead with 2:46 remaining, a Mavericks win seemed likely. The Clippers scored 10 straight points over the next 81 seconds but were unable to take the lead. Free throws from Dirk with 17 seconds remaining finally sealed the Dallas win. Blake Griffin, Clippers: The Clippers' comeback fell short against the Mavericks, but Blake was a force all night long with 25 points, 10 rebounds and 11 assists for his first triple-double of the season. Tony Parker, Spurs: Parker couldn't get anything going in the second game of a back-to-back, managing only six points on 3-of-10 shooting in San Antonio's streak-snapping loss in Oklahoma City. Nick Collison on his head wound: "It's one of those that's awesome with the blood coming down your face because you get the credibility." "We never thought about the streak in the first place. To us, it is just another game." -- Spurs coach Gregg Popovich, on San Antonio's 106-94 loss in Oklahoma City, which snapped the Spurs' 19-game winning streak. 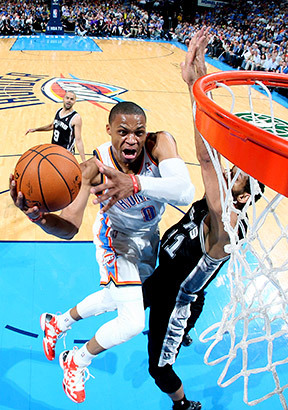 Layne Murdoch Jr./NBAE/Getty Images Russell Westbrook poured in 27 points to help Oklahoma City snap San Antonio's 19-game winning streak. Kevin Durant scored 28 points to lead the Thunder and has averaged 26 points per game against the Spurs this season. He's scored 25 or more points in 39 straight games, the longest single-season streak since Michael Jordan had a 40-gamer in the 1986-87 season.